The Adam and the Eve, the man and the woman, are different anatomically, emotionally and by nature. But did you know the similarities between a man and a woman does not end there? The brain of a man and a woman are structured differently? Yes, due to the differences in their brain, their logical reasoning, perception, analysis, emotions and the sense of sound and space are distinct. Fundamentally their brain varies by virtue of chemistry, processing, activity and structure. 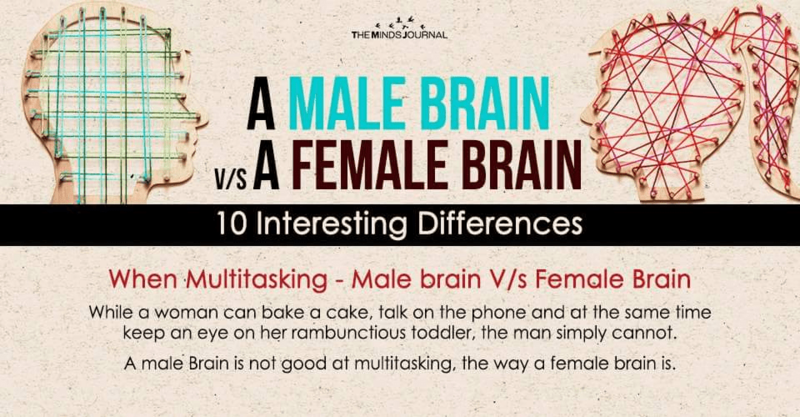 Read on to find out 10 amazing differences in the brain of a man and a woman. How often did you have to yell at your husband for watching the soccer match so attentively, that he could not hear the baby crying in the next room or the doorbell ringing? Lady, please know that he is simply not good at multitasking the way you are! While you can bake a cake, talk on the phone and at the same time keep an eye on your rambunctious toddler your man cannot. And the reason is very obvious his brain is not wired to do multitasking the way you do. The female brain makes use of the white matter more than the male. Also, the number of processes in the female brain is more. The male brain only has a single process. The reason why every time she wins a debate with you, Or can better reason with your child than you can is because she is a better communicator. I am sure she can bargain like a pro, while you stand in the sideline and admire her skill. Well, she is many many times better at articulating words, putting her point across than you! Women are caregivers, healers, and nurturers. Whenever you are sad or depressed, her hug makes you feel all is right in the world. And every time you see your infant bonding with your woman, you cannot help but marvel at her. You want a scientific explanation for that? Here goes: The female brain produces higher levels of serotonin and oxytocin. The oxytocin is also released in the females during child birth which helps in forming the bond between the baby and the mother.